package.el is the built-in package manager in Emacs 24.
package.el is bundled with Emacs 24, but it’s not bound to Emacs 23. Before it became part of Emacs it was an external package, known as package.el that was tied to repository called ELPA (Emacs Lisp Package Archive). So even if you’re an Emacs 23 user you can copy the latest version of package.el from here and enjoy it. Alternatively, you can use the great el-get, another package manager for emacs (23 and others) which uses a diversity of sources, included ELPA. Put the following snippet of code near the beginning of your Emacs config, since you’ll definitely want packages installed via package.el to be initalized before you start tweaking them. package.el connects to a list of package repositories, retrieves the list of the packages there, presents it to you in a interactive fashion and lets you install the packages you like (of course you can also remove the ones you don’t like). package.el understands the dependencies between packages and if one package requires others to run they will be installed automatically (which is really neat). The magic starts with the command M-x package-list-packages. At this point you should see something in the lines of this. You can navigate the list of packages, mark the ones you want to install with the “i” key or the ones you want removed with the “d” key and when you’re done you can press the “x” key to execute the scheduled actions. A little drawback is that some packages won't load automatically at startup. Be sure to read the package description (press Enter), you may have to add a few lines to your .emacs. Initially package.el didn’t provide the option to update a package, but that is fixed by now. You can press “U” (package-menu-mark-upgrades) to mark all the packages that need an update. To execute all the updates press “x”. Marmalade provides a web based UI for package upload and search (both quite buggy unfortunately) and the ability to share the maintenance of a package between several people, who’ll be able to upload new version of the package. There’s also a Emacs Lisp Marmalade tool, that allows you to submit packages directly from Emacs. There's also MELPA, which is the largest and most comprehensive package repository: it builds packages directly from the source-code control systems of upstream developers, which can then conveniently be installed by end users via package.el. This code check if all of the packages in the list are installed and if any of them are not installed if refreshes the local package database (in the case a required package for recently added to the remote repo) and installs them. But the use-package macro (by J. Wingley, Emacs maintainer) also helps in doing that, and more. It allows to declare packages, install and load them asynchronously and declare their configuration. Cask is a project management tool for Emacs that helps automate the package development cycle; development, dependencies, testing, building, packaging and more. Cask can also be used to manage dependencies for your local Emacs configuration. slugelisp, an alternative website to browse all package.el packages, search by name and quickly see their documentation, and search in their documentation. It is slower than melpa.org but a bit more complete. That is the goal of Try (on MELPA). Once installed, you can M-x try RET a-package [or url] RET. Packages from ELPA will be stored in a temporary directory by default. This is possible with the package Try (on melpa). Packages will be stored in a temporary directory by default. you can also put an url pointing to a .el file. 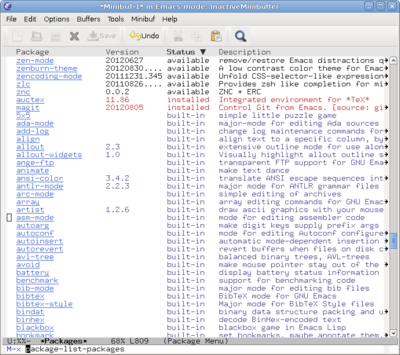 straight.el is a "Next-generation, purely functional package manager for the Emacs hacker". Borg assimilates packages into the ~/.emacs.d repository as Git submodules. It provides only a few essential features and should be combined with other tools such as Magit, epkg, use-package, and auto-compile. This page was last edited on 15 November 2017, at 05:49.